The iconic train the Palace on Wheels is old world charm personified. Keeping alive the regal heritage, it ensures that you too relive a royal life as it encapsulate the royal lifestyle of erstwhile Maharajas. What is more is that in this seven day sojourn you get to greet a tiger, you see one of the seven wonders of the World- the symbol of Love-Taj Mahal, and great culture and colours of Rajasthan. So get ready to live myriad aspects of travel that include, historical monuments, wildlife, shopping, culture, desert safari and much more fun in just a week. Accommodation POW has 14 residential cabins. 13 saloons having 03 twin bedded rooms in each saloon (deluxe cabins). The cabins have been created in three different themes in hues of exquisite jewels, Ruby, Sapphire and Pearl. Each and every saloon of the luxury train has been named after the erstwhile princely states. The names are Alwar, Bharatpur, Bikaner, Bundi, Dholpur, Dungerpur, Jaipur, Jaisalmer, Jhalawar, Jodhpur, Kishangarh, Kota, Sirohi and Udaipur. 01 saloon is having 02 Super Deluxe Cabins (Suites). 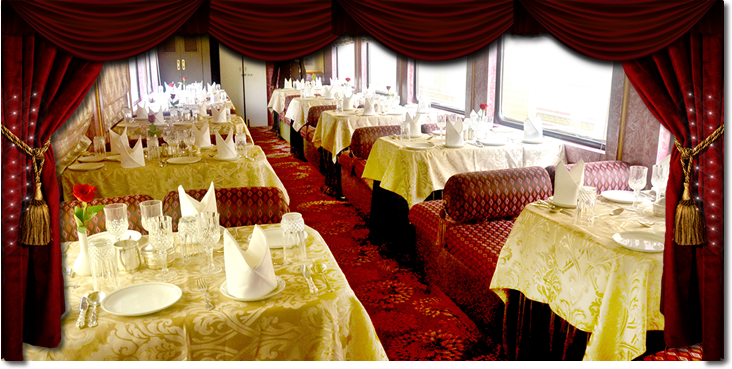 Restaurants Maharaja & Maharani, the two Restro-Bars on the Royal Train with seating capacity of 40 pax each . Indoor Games Indoor games are available on demand like Chess, Playing Cards. Chinese checkers, Carom Board, and Crossword Puzzles etc. are available on the train. Medical Aid First aid is available on the train whereas a doctor can be arranged on call. At every Destination. Doctor is available for 1 hrs. for free consultancy in Bar/ Lounge car. News Papers & Magazines Various national dailies and magazines are available on board. Laundry Laundry service is available on board in Jaipur and Udaipur to serve you better. Locker (Safe) A separate safe is provided in your cabin to store your valuables. 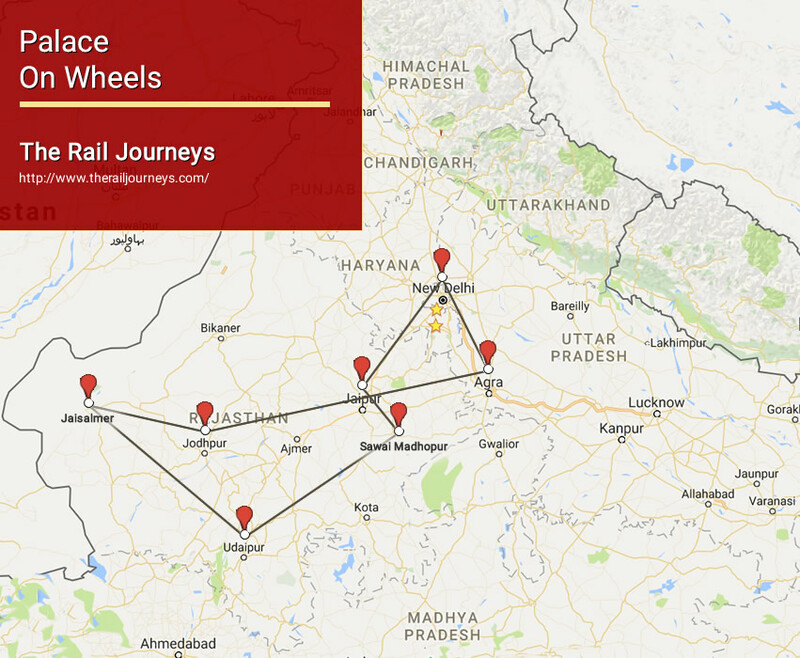 The Palace on Wheels train takes you through a seven day exploration of the vibrant Rajasthan. The magic of the splendid journey begins at New Delhi and prepares you to weave the fabric of delightful imagination becoming reality over the next seven days. Your royal journey begins from Delhi and takes you through various erstwhile princely states of Rajasthan like Jodhpur, Udaipur, Chittaurgarh, Swai-madhopur, and Jaipur. 16:30 hours Assemble at the railway station at least an hour before the actual departure time to complete check-in and registration formalities. The train leaves Delhi at around 1830 hours and proceeds towards its first destination Jaipur. Dinner is served on board. Overnight stay on Palace On Wheels. 07:00 hours Breakfast will be served on board. 08:00 hours Departure by coach for sightseeing tour of Jaipur. The first stop of Palace on Wheels is Jaipur, one of the most well planned cities of the world of its time. This capital city of Rajasthan, popularly known as the Pink City, was founded by Maharaja Sawai Jai Singh II, in1727 A.D. To explore the city, an air-conditioned coach takes you to Hawa Mahal or the Palace of Winds, which is a remarkable five storied building along the main street of the old city in pink splendour with semi-octagonal and delicate honey-combed sandstone windows. 13:30 hours After reaching at Amber you can enjoy the festively decorated elephant for a ride up to the fort. After lunch visit of Amber fort the best example of splendid fusion of Rajput and Mugal style of Architecture. 16:00 hours The Luxury coach will take you back to Palace on Wheels, Dinner will be served on board. 05:30 hours Arrival at Sawai Madhopur. One can almost sense a life of the wilderness, as the Palace on Wheels arrives in Sawai Madhopur, a city named after its founder Maharaja Sawai Madho Singh I. A visit is arranged to the Ranthambhor National Park, wherein are located the ruins of a 10th century fort. This wildlife sanctuary is considered to be the country’s best for observing and photographing the activities of the tiger. The park, covering an area of 392sq kms is hometo more than 300 species of birds. The tiger, hyena, ratel, jackal and fox are among those constituting the carnivorous population here. Sawai Madhopur is known for its exclusive toys, ethnic ornaments and costumes. 06:00 hours Departure for Ranthambore National Parl (Sanctury visit). 10:30 hours Departure for Chittiogarh. 16:30 hours Sightseeing in Chittorgarh, where we view the Images of love and valour; scars of battles lost and won. thrice-besieged, Chittorgarh Fort is all this and more, the Victory Tower and the Tower of Fame. You will also have an opportunity to witness the sound and light show at the majestic Chittorgarh Fort. 19:00 hours The Luxury coach will take you back to Palace on Wheels, dinner will be served on board. The Palace on Wheels stays in Chittorgarh station until the early morning before departing for Udaipur. 08:00 hours Arrival in Udaipur. The city was founded by Maharana Udai Singh of Mewar, after the Sisodia dynasty was driven away by the Mughals. 09:00 hours Departure for Sight Seeing by coach and visit Sahalio Ki Bari, shopping and City Palace & Crystal Gallery. 01:30 hours After lunch at a Palace Hotel, we see one of the most beautiful sites of Udaipur, as we cross Lake Pichola by boat, past the majestic Lake Palace Hotel idyllically situated in the middle of the lake. 15:00 hours The Luxury coach will take you back to Palace on Wheels. 15:30 hours Departure for Jaisalmer, dinner will be served on board. 09:15 hours Arrival at Jaisalmer. 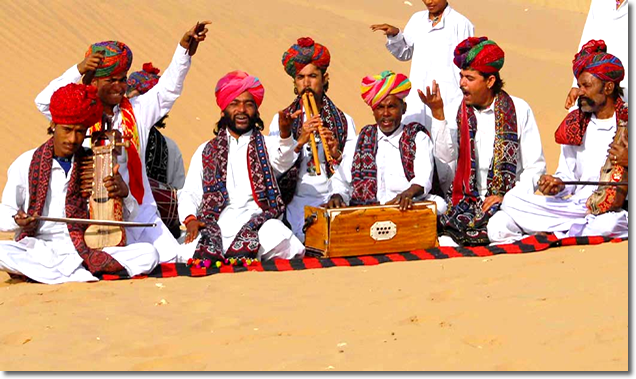 In the heart of the Thar Desert lies Jaisalmer, founded by Rawal Jaisal, in 1156A.D. Here the yellow sandstone fort is an imposing sight, towering magnificently over the city. 09:30 hours Discover the painstakingly latticed Havelis or mansions with their grand facades. The Nathmalji-ki-haveli, Patwon- ki-haveli and Salim Singh-ki-haveli are fine examples of the stone carver’s skill. 13:30 hours Enjoy lunch at palace hotel. 15:30 hours After lunch, go for an exciting camel ride on the sand dunes of Sam, before sipping a refreshing cup of tea enjoying the sunset. 19:00 hours Arrival on the train. 19:45 hours Later enjoy the dinner and the cultural programmes at Palace Hotel. 07:00 hours Arrival at Jodhpur a city ringed by a high stone wall with seven gates and several bastions. This second largest city of Rajasthan, founded by Rao Jodha in 1459 A.D. is known for its rock-solid Mehrangarh Fort. 09:00 hours Proceed for sightseeing tour of Jodhpur visiting Mherangarh Fort. The grand palaces within- Moti Mahal, Sheesh Mahal, Phool Mahal, Sileh Khana and Daulat Khana are impressive examples of architectural excellence. Near the fort complex lies the Jaswant Thada, and a group of royal cenotaphs made of white marble. 13:15 hours Lunch will be served at a city hotel. 14:45 hours The Luxury coach will take you back to Palace on Wheels. 15:00 hours Departure for Bharatpur. Dinner will be served on board. 05:00 hours Arrival at Bharatpur, Early next morning, the Palace on Wheels arrives in Bharatpur, the capital of Maharaja Suraj Mal. 06:00 hours Visit to the world famous bird sanctuary, Keoladeo Ghana National Park, the nesting place of thousands of Egrets, Siberian Cranes, migratory Water Fowl and other species of birds. 10:30 hours Arrival at Agra Railway Station. 13:30 hours Lunch at the 5 Star hotel. 15:00 hours Move on to pay a visit to Taj Mahal, one of the seven wonders of the world. 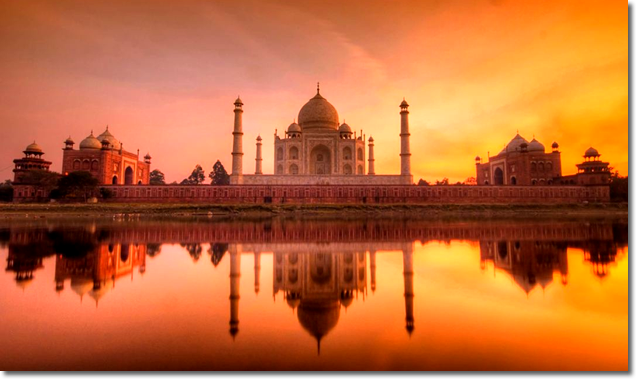 A pristine monument of undying love; It was built by Emperor Shah Jahan in memory of his beloved queen Mumtaz Mahal. 17:30 hours Shopping Tour – Agra is also known for its splendid marble inlay work like the Pietra Dura work on the Taj, leather goods and jewellery. 20:00 hours Dinner will be taken at the hotel, later on the Luxury coach will take you back to Palace on Wheels. Bid farewell to the train & perhaps a final drink in lounge bar. 07:30-08:00 hours Bid farewell to the Palace On Wheels. INR 900 per pax commercial tax as applicable ( for INR tariff only).